Jozu is the one who's not Quinn. 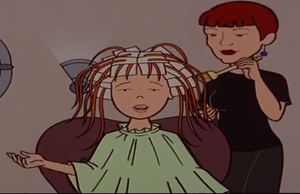 Jozu works at the beauty salon Tres Tress in "Just Add Water" and has an English accent. Quinn knows her well enough that she can talk about Fashion Club politics and assume Jozu knows what it all means. When famous model Marco came in, Jozu alerted Quinn and recommended they act like they hadn't noticed, which swung the girl a date. Jozu looks out for you! This page was last edited on 25 April 2018, at 22:51.